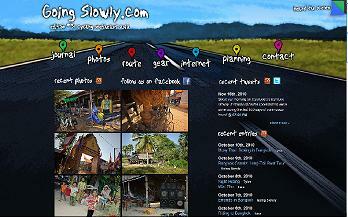 Going Slowly with Tara and Tyler – Go Bicycle Touring! Tara Alan and Tyler Kellen of Going Slowly are two of the most inspiring cyclists currently on tour. The couple writes about life on the road and its daily ups and downs with sensitivity, humor and insight. Not only is the writing beautiful, so are the photos, videos and audio recordings. Tyler and Tara aren’t particularly obsessed with bicycles. They’re just two people who want to see the world. So far their tour has taken them through 21 countries in Europe and Asia. They travel slowly, averaging around 60 kilometers a day, which leaves them plenty of time to be creative with their website. As we lay in our tent this morning, still warm in our sleeping bag, surrounded by mountains, miles from the nearest village, rain began to spatter on our tent and I suddenly felt overwhelmed with hopelessness. The roads we’d been riding were barely passable in good weather, but in rain, I didn’t see how we could continue at all. Even the push up the steep path, back up to the real “road” would be impossible. We’d be stuck out here, at the mercy of our surroundings, for god knows how long. Though we just stocked up on food and had enough for several days, being trapped in the mountains was another story. We would sit, stuck in Romania, slowly watching our supplies dwindle down to nothing. At which point, we would waste away and die. Tyler, with a finely-honed sensitivity to my every mood immediately said, “I feel a heaviness coming from you. What’s your deal? Come on, spit it out.” And I had to laugh, and thank the heavens I found such a perceptive partner, who knows when something is up with me, sometimes before I can even articulate it. I told him about my fears, and he laughed as usual, and re-assured me as well as he could. Thankfully the scattered drops stopped, and did not create mudslides, avalanches, or other causes for distress. So we packed up camp, ate breakfast, checked email, filled our water bottles, and got ready for the big push out of the bowl we had camped in. After you’ve browsed through the archive for awhile, you’ll be itching to get on your bike and go. Now’s the time to have a look at How We did It. This is a step by step account of the run-up to their world tour. Highly helpful. There’s also a great Gear Section which is particularly useful as costs are listed for each item. 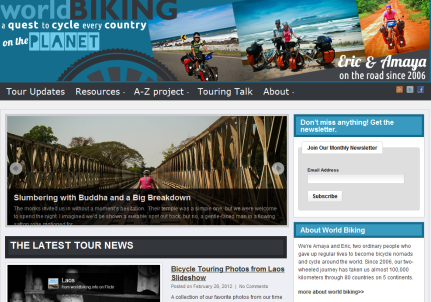 Tara and Tyler set out to create a website to help anyone dreaming of a long distance bicycle tour understand more clearly what it takes to pack up and leave the comforts of home behind for the excitement and adventure of the open road. They have succeeded in doing just that. Quick, check out Going Slowly before the tour comes to an end in 2011.